If you are over-mortgaged and facing negative equity in your home, can you walk away from your mortgage in Canada? We explain what you can do when you can’t pay off the entirety of your mortgage loan after a sale or bank foreclosure. How does a mortgage shortfall happen? If you’re a homeowner and your mortgage is higher than the equity or the market value of your home, you are by definition, underwater. Meaning, if you sold your home today, you are not likely to get the full mortgage paid out by selling. 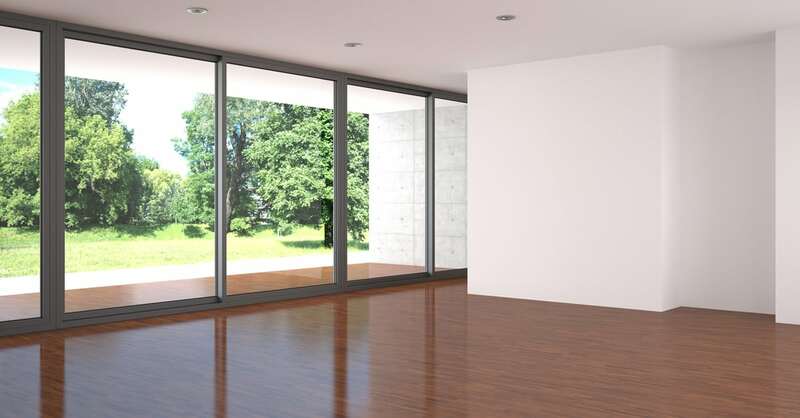 Put another way, you have negative equity in your home. Price decline: you bought at the peak with a high-ratio mortgage, and the market dropped. For example, you bought a condo or a house for let’s say a million dollars with 10% down. The market subsequently flattens, and the list price is now $800,000, so you’re underwater by $100,000 plus selling costs, real estate commissions and potential mortgage penalties. Debt consolidation: our typical homeowner client has more than $50,000 in unsecured debt. If you consolidate this through a second, or even third mortgage and the market softens, you can easily find yourself with less equity in your home that the total of all your mortgage debt. Negative investment cash flow: you may have purchased an investment property and are funding the rental shortfall via a secured line of credit. If the market does not increase sufficiently to cover your accumulated cash loss, you may find yourself facing growing negative equity. A theoretical shortfall is not a real shortfall. You don’t have to sell. If you can keep your mortgage payments current, and expect that the market will return before you intend to sell you can hold tight. If you are in default your lender will begin proceedings to collect. If you do not respond and cannot catch up on missed mortgage payments, your bank or lender will likely begin proceedings to sell your home through a power of sale. If you sell with a shortfall, or your bank forecloses, you still owe your mortgage lender any deficiency between the money realized from the sale and the balance owing on your mortgage. Full recourse means that a lender can pursue you if your house is underwater and you sold your home, and there’s a shortfall … your mortgage lender can come after you legally for that debt in Canada. How do I deal with an unsecured mortgage shortfall? Like any debt, you are expected to make payments on it. If you are unable to pay back this shortfall, your creditors will pursue legal actions like a wage garnishment. In the case of CMHC, while it may take some time, they can also seize your tax refunds. In Ontario, any mortgage shortfall after the sale of your home becomes an unsecured debt. Initially, your mortgage lender was a secured creditor. However, because the security, your home, has been sold, there is no longer any asset attached to the debt, and they are now an unsecured creditor. If your mortgage was subject to insurance because you had a low down payment, your first step might be to draw on your CMHC Insurance. In this case, CMHC pays your original lender. However you still owe the debt, it’s just that now CMHC is now your creditor. File for bankruptcy to eliminate what you owe faster and get a fresh start. The best place to start is to speak with a licensed debt professional about your relief options. I think the big mythbuster here is that if you have a shortfall on a house that someone’s pursuing you for, a consumer proposal or a personal bankruptcy actually takes care of that. And that’s where I think a lot of people are pretty surprised about Canada’s legislation around this stuff. For a more detailed look at how to deal with mortgage shortfalls and how lenders can pursue you to recover a mortgage shortfall in Canada, tune in to today’s podcast or read the complete transcription below. Doug Hoyes: What happens if you buy a house and take out a mortgage and then can’t pay the mortgage? Can you just walk away from your house? That’s the question on today’s episode of Debt Free in 30 and to answer that question I’m joined by Scott Terrio, manager of consumer insolvency here at Hoyes Michalos. Scott, welcome back to the show. Are you ready to talk real estate? Scott Terrio: Yes, it’s the subject that everybody talks about in Toronto. Doug Hoyes: Well, and that’s where we are today in our office here at Yonge and King in Toronto. It’s the start of the fall of 2018 and the reason we’re recording this in Toronto is, as you say, that’s the big topic of conversation at every event you go to. It doesn’t even have to be an event; if you’re standing there waiting for the subway then people are talking about real estate. Scott Terrio: Pretty much, yeah. Doug Hoyes: So, what are you seeing in the real estate market right now? Scott Terrio: Well, of course we’re not real estate experts so you’d have to speak to somebody like a Ben Rabidoux or a Scott Ingram if you wanted to get precise numbers on this kind of stuff but, from the people I talk to and from what I see in my neighbourhood, prices seem to be still pretty strong. Condos are strong. There’s been some weakness in some detached homes especially in the outlying areas of the city; 905 etc. But prices are still a lot higher than they were a few years ago so . . .
Doug Hoyes: Yeah, you compare it to a few years ago and it’s a no-brainer. And I think that’s what we see in our Hoyes Michalos homeowners bankruptcy index as well where we track how many people are filing a bankruptcy or a consumer proposal with us and they own a home at the time they file. That index peaked at around 35% back in February of 2011, which meant that 7.5 years ago more than a third of our clients owned a home at the time they filed bankruptcy or consumer proposal. Doug Hoyes: For most of 2018 that index has been fluctuating between about 4% and 7% and those are by far the lowest levels we’ve seen since we started tracking this in 2007. So, what does that tell you? Scott Terrio: Well, in a nutshell, people who own homes aren’t going bankrupt. Scott Terrio: That’s pretty much it. I mean we do get people filing bankruptcies who own homes but it’s pretty few and far between because most of those people would opt to do a proposal. But, as you said, I mean if you’ve – part of the effect of this consumer debt trend has been kicking the can down the road and if you own a home, you’re able to do that more likely than people who aren’t for example, right? That’s people who last out longer. Doug Hoyes: Yeah, I think that’s exactly right and we also know from our Joe Debtor study that of the small percentage of homeowners who do end up becoming insolvent, they have more unsecured debt than non-homeowners. So our average client – I’m just going to give you rough numbers because of course they change over time – but our average client has about $50,000 worth of unsecured debt. But if you’re a homeowner, who gets into such serious financial trouble that you have to do a bankruptcy or consumer proposal, they’ve got over $70 000 of unsecured debt. Things like credit cards, bank loans, that sort of thing. Doug Hoyes: So, why is that? Scott Terrio: Yeah, this is probably the thing that amazes people the most out of all the things that people like you and I tell people. It’s because if you own a home you’re more credit worthy; generally speaking. There’s more to it than that but, you know, there are more expenses, you have to have more stuff or you think you have to have more stuff and so that 20 or $25 000 difference is pretty significant, I always think. I mean it doesn’t mean that renters are any more careful with their money or homeowners aren’t, it’s just that when you have a house there’s all this other, you know, the trappings and the credit worthiness and it tends to be what we see, isn’t it? You know, you have a house and, you know what, if you’re rolling in here with $50 000 in debt as a renter, you’re probably going to have 70 or 80 as a homeowner. Doug Hoyes: It’s pretty much that simple. So okay, let’s talk about what it means to be underwater. This is the slang term; underwater. What does underwater mean? Scott Terrio: Yeah. So underwater is simply math. It’s when you’re a homeowner and your mortgage is higher than the equity or the market value of your home. So, let’s give an example; you bought at the peak in April or May of 2017 and, you know, you bought a condo or a house for let’s say a million dollars. Just by virtue of the flattening of the market, you might be at 900 000 now as far as what you would list your house at, so you’re underwater by 100 000. It doesn’t mean anything, you don’t have to sell. I think people get worked up when you tell them they’re underwater because they think “Well, I can’t lose my house.” But you don’t have to, right? You’re just not going to get the full mortgage paid out by selling the house. Doug Hoyes: Well, so let’s go through this whole process then. So let’s assume, using your example, I bought a house at the peak; May of 2017 which was pretty close to the peak – April, May. I had a 5% down payment, because why not, right? Scott Terrio: Yeah. Why wouldn’t you. Doug Hoyes: And here we are, you know, a year and a half later and I’ve got a great job offer in another city so I’m going to pick up and I’m going to move. I’m going to sell my house. But, the price of my house – because let’s say I bought a detached house and it’s down 10% from what I bought it which is not totally crazy from what we’re seeing at the moment. Scott Terrio: No, it certainly isn’t. Doug Hoyes: So when I pay the real estate commissions to sell the house and, you know, penalties to break the mortgage, whatever, I won’t get enough to pay off the mortgage. Scott Terrio: Right. That’s underwater. That’s exactly what underwater means. Doug Hoyes: So, what are my options as I sit there today with an underwater house? Scott Terrio: Well okay, so if you’re going to sell the house and move, you know, there’s going to be a shortfall, right? Scott Terrio: You’re not going to have enough to pay the mortgage. Unless you’ve got that other amount somewhere to pay that lender off, that is now something that – or it’s an amount that they’re going to come after you for potentially if you didn’t pay it. Scott Terrio: Sell the house. Doug Hoyes: But the problem is, let’s say that I’m going to be $50 000 short after paying the mortgage, real estate commissions, whatever. Doug Hoyes: So option number 1 is I say to the mortgage holder “No problem, I’ve got 50 000 bucks in my pocket so I’ll just kick in the 50 000 that allows the house to sell. Doug Hoyes: Okay, most people probably don’t have 50 000 in their pocket. If they did, they probably would’ve had a bigger down payment to start with. Doug Hoyes: So, let’s assume that’s not possible. Doug Hoyes: Okay, so I’m faced with selling the house, I’m underwater, I don’t have the money to make it whole; what are my other options? Scott Terrio: Okay, so – and this is where a lot of our information in Canada, or misinformation I should say, comes from our neighbours to the south. I mean, the U.S. is, you know, is all over us in terms of media presence etc. So, when the 2008 crisis hit in the States, mostly in the south, but it was all over the place, people were walking away from their houses because there was no recourse. So they said “Okay” – the term was Jingle Mail. Doug Hoyes: So what is Jingle Mail? Scott Terrio: That’s where you put your keys in an envelope and you mail it to the lender and say “Guys I’m out of here. Have fun, sell the house for what you can and so I owe you 300 000. See you later, you can’t come after me.” I’m not sure anybody actually did that but it’s a great little term. Doug Hoyes: Yeah, Jingle Mail. Keys are jingling in the envelope there. Scott Terrio: Yeah. But that was pretty widespread. You know, there were states where that was happening like a lot in certain neighbourhoods. So that’s not the way things work here. Doug Hoyes: So you mentioned the term ‘recourse’. Doug Hoyes: So explain recourse, full recourse, non-recourse. Scott Terrio: Yeah, I brushed over that technicality. Doug Hoyes: I knew you didn’t want to explain that hard word so tell us what recourse means. Scott Terrio: So, recourse means that a lender can pursue you if your house is underwater and you sold your house and there’s a shortfall of 100 000 or so. So your example, I don’t know, it was a million and you’re at 900 000 you sold it for – so there’s a 100 000 missing essentially. The lender’s out a 100 000. So they can come after you legally for that debt in Canada, okay? In the States they can’t. It’s different provincial rules. Doug Hoyes: Right. So in Ontario we have full recourse meaning if there’s a shortfall, you’re on the hook for it. In the U.S. in certain states – and we’re not U.S. experts, we’re not going to go through every 50 states – but there are many states where the bank has no recourse. Doug Hoyes: Which means you walk away from your house, they can’t sue you for the shortfall. Doug Hoyes: Not the case here in Ontario though. Doug Hoyes: They have full recourse. Doug Hoyes: So, if I can’t make the payments on my mortgage and I say to the bank “Here you go, here’s the keys, I’ll put them in an envelope so they jingle. Here’s the keys.” The bank sells the house, there’s a $100 000 shortfall, they’re coming after me for it. Scott Terrio: Yeah, the lender has the option in that case. That’s enough of a debt. They probably will do that and they have their lawyer take the motion to court and file a suit against you and come after you for the shortfall. Doug Hoyes: So let’s go through that process then; so I’ve decided that I can’t make the payments. So I miss my first mortgage payment. I’ve been up to date for the last year, I miss my first payment – is anything going to happen the next day? Doug Hoyes: It doesn’t happen that way. Scott Terrio: No, the banks aren’t coming after people for one missed payment. If you’ve been current for a long time – maybe if you’ve missed some in the past couple of years and they’re a little nervous about you, they get you a red flag then they might send you a letter and say “Hey look, you know what –”. I mean they have to let you know if they’re going to take action against you anyway. There’s a notice period and whatever. Scott Terrio: Yeah, they’re not selling your house right away and they have to let you know even if they did anyway. But that’s not how it works. So I mean you’ve got – you’ve probably got a payment you can miss as long as you make it up, realistically. I think, you know, where you’re starting to miss two payments, maybe three, then you need to be pretty concerned. Banks aren’t going to let that go for any much longer than a couple of payments I would think. Just generally speaking. Doug Hoyes: And we’re speaking in general terms. In my experience, chartered banks are different than alternative lenders. Doug Hoyes: You know, Joe, the mortgage dude, probably has a much shorter timeframe when he’s going to be taking action than a big bank. Doug Hoyes: And obviously it also depends on what’s happening in the economy. If house prices are still going up, okay the bank can afford to wait a little extra time because the price is probably going up. Doug Hoyes: But if things turn the other way then all of a sudden the banks are a little more nervous. Scott Terrio: Yeah and that trickles down as you said. So if the banks are getting nervous, certainly the secondary lenders are getting nervous and then the private lenders are probably not going to give you much time at all because they’re going to be really concerned about their investment, right? Doug Hoyes: So from a point of a view of the process then – so let’s say a certain period of time has elapsed; three months, six months, whatever it is. You haven’t made any payments. So the lender is then going to do what? Scott Terrio: Well, the lender is going to get in touch with you somehow – letter. It will have to be a paper trail, e-mail, whatever. Probably there’ll be a lawyer involved, that lender’s legal representative. So it will come on a lawyer’s letterhead maybe with bank copied or whatever, and it’s going to tell you, you know, you have certain, you know, a certain time period to remedy this, right? “Pay this, pay the following, get yourself up to date, we won’t do anything.” Or else in there will be the, you know, “We’re going to take your house and sell it by a power of sale.” That’s where you’re getting into the legal stuff and that’s where you need to be – you’re going to lose your house next. That’s the step that if you don’t remedy this now, X follows beyond it, yeah. Doug Hoyes: And so in my experience, yeah, you’re going to know months in advance of them coming to change the locks. Scott Terrio: Yeah. Well you’re going to know you didn’t pay them for three months. It’s not going to come as a massive shock but when you get that letter you need to do something, yeah. Doug Hoyes: Yeah, so at some point then the bank can start the foreclosure proceedings which means they go through a bunch of stuff, there’s paperwork they have to file, you know, this that and the other thing, but ultimately, it’s now their house. Doug Hoyes: Well, I shouldn’t say that – they now have the power to sell the house which is why it’s called power of sale. They have the power to sell the house. They sell it and obviously they’ve had you removed from the house before that. You’re probably going to leave anyways. And if there’s a shortfall, at that point they’re coming after you for it. Scott Terrio: Right, and that’s where it goes from, you know, mortgages are secured, car loans are secured, and that’s where some of the terminology in here gets confusing for people so I’ll just kind of try and clarify that. When they sell the house and there is a shortfall, that shortfall of 100 000 or whatever, that is now unsecured. Because they’ve sold the security, they haven’t covered the entire amount owing and the 100 000 is the difference. So the shortfall is now unsecured debts just like credit cards, lines of credit, etc. and that’s why they’re coming after you in the court. Scott Terrio: They will liquidate the house so . . .
Doug Hoyes: It’s unsecured at that point. Scott Terrio: Yeah, the rest, they’re out of luck, yeah. Doug Hoyes: Now the complicating factor in a lot of these things is that the mortgage is insured often by CMHC; Canada Mortgage and Housing Corporation. Scott Terrio: First thing people ask. Doug Hoyes: Right. So, the bank – let’s say I’m dealing with a conventional bank – they decide to sell the house. They sell it, they go through the whole legal foreclosure proceedings. There’s a shortfall. They will then draw on their CMHC insurance to cover that shortfall, right? In most cases. Doug Hoyes: So it won’t be the bank necessarily pursuing you for the shortfall, it will be CMHC. Scott Terrio: Yeah, ultimately it’s CMHC that’s going to be out in that scenario. That’s right. As the insurer, yeah. Doug Hoyes: Yes, as the insurer. Now in my experience, it takes CMHC a long time to pursue people and in fact, I have seen cases, many cases – this isn’t an isolated thing – many cases where it’s been ten years later. Scott Terrio: Yeah, I’ve seen some long ones, yeah. Doug Hoyes: So, does that mean you can just wait for ten years? Scott Terrio: Well, you can. I guess it depends what happens in the meantime. I mean is there interest attached to that? Like is it growing? Does it stay static? 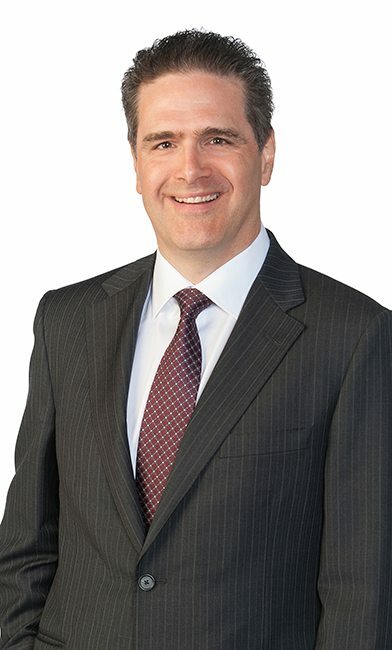 Doug Hoyes: Well and with CMHC, they are a division of the federal government and so, in my experience, they will start taking your tax refund. Scott Terrio: Yeah, and there’s lots that they can probably do, right? Whereas, you know, a bank or something, they only go take you to court for the exact amount and etc etc, according to whatever the agreement was. You know, CMHC is a government body as you said so therefore, I mean, they could probably, you know, lean on CRA a little bit and say “Okay, well what’s this person got? Are they a wage earner? Like could we garnish wages? What can we do to make ourselves as the tax payer whole?” right. Doug Hoyes: Yeah and CMHC can’t just start garnishing your wages, obviously they have to go through the court process like any other creditor. But yes, if you’re getting tax refunds every year, it’s very common and very easy actually for them to starting seizing that. Scott Terrio: Yeah, that’s the easiest way because they just don’t give it back to you, right? Or they don’t have to go get it, they just say “Okay, well here’s your $3 000 tax refund for this year. Sorry, you’re not getting that because you still owe us 50 000 over here for the shortfall of the house. Doug Hoyes: Now if the mortgage holder or if the insurer has gone to court and got a judgement against you and done the whole foreclosure proceedings, there is no time limit on that judgement. Scott Terrio: That is . . .
Doug Hoyes: So if they’ve got a judgement, it’s not like well they’ve got to start collecting in a year. It can sit there for practically forever. Doug Hoyes: They want their money. Doug Hoyes: Okay. So, what do I do if I’m in that situation then? I was not able to keep my house – and again, this is not a situation that we have seen recently. Anybody who bought a house in the last five years, it’s probably worth more than what you paid for it. So even if you couldn’t pay the mortgage, well you just sell it yourself. I think as we go through the thought process, if you can sell it yourself and recover enough to pay off the mortgage, that’s what you’re going to do. Scott Terrio: Don’t need us. Doug Hoyes: Yeah. And why would you let the bank sell it because of course, in a power of sale, they’re getting less money than what you would get if you sold it yourself. That just is common sense, right? Doug Hoyes: If the sign says power of sale and I’m buying the house, well I know that perhaps it hasn’t been fully maintained, there’s probably problems, so I’m paying less than market value. Doug Hoyes: So you would try to sell it yourself first. If I can’t sell it myself, because it’s underwater, the bank sells it and now someone; the bank, the mortgage lender, CMHC, whatever, is pursuing me for the shortfall. What are my options at that point? Scott Terrio: Right. So, the first thing I’m going to tell anybody of course, is you call Doug or you call Scott. You talk to a licensed trustee and you say “What can I do about this.” Because, as I mentioned, that is now an unsecured debt. So licensed trustees who file personal bankruptcies and consumer proposals for people, deal with unsecured debts. So I think the big myth buster here is that if you have a shortfall on a house that someone’s pursuing you for, a consumer proposal or a personal bankruptcy actually takes care of that. And that’s where I think a lot of people are pretty surprised about Canada’s legislation around this stuff is that you can actually put that – like in other words you can get rid of that by virtue of filing it. It’s included in your bankruptcy or your consumer proposal. And usually these shortfalls, like they’re significant, right? It’s not – nobody has $2 000 shortfall on their house. Doug Hoyes: It’s not a thousand bucks. Scott Terrio: It’s like 50, 100, 150. I’ve had a guy that I signed not too long ago who had two properties out west. He was well over 400 000 on these two rental properties when the Alberta market went south. So, you know, it can add up in a hurry and most people can’t even dream of paying the amount that they owe, right? Doug Hoyes: And it’s a valid point because we’re seeing, when it comes to real estate shortfalls, it’s very common that it was somebody who went out to a place like Alberta, worked in the oil patch, whatever, bought a house in Fort McMurray, whatever, and now they’re back here because, you know, the work is here. And so many people, also in Toronto, have gotten into the investment property thing as well, right? Scott Terrio: Hm-mm. So now you’ve got a house “But I’ve also got this rental property” and if you’ve got two of those and everything goes south on you, you know, you’re looking at six figures in a hurry, right, of a shortfall. Scott Terrio: With 5%. Why wouldn’t you? Doug Hoyes: Well it’s been a brilliant strategy for the last 10 or 15 years. Doug Hoyes: You buy a condo in pre-construction. By the time it’s built, it’s worth a few hundred thousand more than what you paid for it. You rent it out, rents are high in this city as in most places in Ontario. It’s covering or almost covering the mortgage but even if it isn’t, who cares. Scott Terrio: You just made 200. Doug Hoyes: Yeah, the prices are going up. Scott Terrio: For a bunch of paperwork. Scott Terrio: Yeah, this is going to be a thing. Scott Terrio: It’s not yet but it’s going to be. Doug Hoyes: And I’ve been saying that for years. I get it. Okay, you know, I’ve been wrong for a while. I didn’t think the real estate market could keep going up and up and up and up. But mathematically, it cannot go up forever. Doug Hoyes: So, you’re in a situation where you’ve got 50, 100 000 whatever. Whatever the number is, and you made the clear distinction. It is an unsecured debt at that point. Doug Hoyes: So mortgages don’t go away if you go bankrupt, if you’re keeping the house, because it’s a secured debt. Doug Hoyes: But if it’s an unsecured debt, then you can file a bankruptcy or you can file a consumer proposal. Now with a consumer proposal there’s a dollar value limit on your unsecured debts. Doug Hoyes: So if I have, like in the example you gave of this guy from out west who had $400 000 in shortfalls, he couldn’t file a consumer proposal. Scott Terrio: No, he’d be into a different proposal, division 1 proposal, a consumer proposal’s division 2 without a big lecture on bankruptcy and proposal 101’s your . . . So he’d be into a bigger, more expensive, more complicated proposal in that case. Doug Hoyes: So I guess if you have $250 000 or less worth of unsecured debt, a consumer proposal makes sense potentially. If you’ve got more than that then you write more complicated procedure, you’ve got to do it under division 1. Scott Terrio: Yes, and it also includes all of your debts. So if you’ve got 250 or 49.9 of your shortfall, it’s also your credit card debt, your taxes owing, lines of credit; so then you’re over 250 already too, right? Doug Hoyes: All unsecured, yeah. Scott Terrio: So it’s just, you know, when you’re filing with a trustee it’s aggregate unsecured debt. So the good thing is it’s all gone by virtue of the proposal of the bankruptcy but now you’re pushing your limit, right? Because most people, as you said earlier, was it 74 000 in unsecured, other consumer debt, right? Scott Terrio: So if you’ve got 200 in your shortfall and as a homeowner what we see is, you’ll probably get another 74 000 in other debts, so now you’re 274 and you’re probably into a different proposal, yeah. Scott Terrio: Right, but you’ve got to talk to your trustee. You’ve got to talk to somebody and you’re better to do it sooner because in our experience as well, you’ve done more of these than I have, almost everybody that I’ve ever filed has said “I should have come in 12 to 24 months ago.” Because human nature, you know, you keep doing your best, you keep pushing things out and debt never gets better with time. Doug Hoyes: Compounding goes backwards and forwards unfortunately. It’s good or bad things. Scott Terrio: So get in, talk to your trustee and learn your options, right? Doug Hoyes: And so the options may be a consumer proposal, may be a division 1 proposal, may be a bankruptcy, depending on what your situation is. Scott Terrio: Yeah because either one gets rid of all the unsecured debt. So everything is – it isn’t that bankruptcy does it more than a proposal, they just do it differently, right? Because I get a lot of people saying “Well, I just want to get rid of my debt.” Okay well, that shouldn’t be the deciding factor of whether you do a bankruptcy or a proposal, right? It’s the mechanism and what makes more sense for you because they’re very different filings accomplishing the exact same thing. Doug Hoyes: So if you had to look forward to 2019, 2020, and of course, we don’t know what the real estate market’s going to do. If we did we’d be speculators and we’d be, you know, buying and selling apartment buildings and all the rest of it. But is it likely to assume that there will be people overextended and we will see a bump in either consumer proposals, division 1 proposals or bankruptcies. So I think there’s an echelon of consumers out there who are in that category of, you know, they’re making okay income but if they lost that tenant in that condo that they have rented out, you know, could they go a month? Could they cover it? Probably not. Not with that income and they have no savings. So I think there’s a whole group of people here who are going to maybe not necessarily – we’re not talking a catastrophe here but we’re talking about people who are very vulnerable in a monthly sense, right? Doug Hoyes: “But I’ve got 500 bucks I can kick in from my job” or whatever. Scott Terrio: “Not from my job or whatever.” As long as everything stays the same. Doug Hoyes: But when a tenant leaves, can you put another tenant in the first day of the next month or is there a month or two period where you’ve got to repaint the place, clean it up, whatever, find a new tenant. Scott Terrio: Yeah, and if you’re not a professional landlord, and those people aren’t, you know, that stuff is hard to do, right? You don’t just go get somebody. You’ve got to screen people, you’ve got to, you know, you’ve got to get the thing out in the public, right? So a month maybe they can cover. Two months, probably not. Doug Hoyes: Yeah, and now you’re playing catch up from there. Scott Terrio: Yeah and then it just probably snowballs after that. So there’s going to be that group before there’s any real estate devastation, right? Doug Hoyes: Yeah, that’s a good point. It might be the one off landlords who end up getting it, yeah. Scott Terrio: Yeah, I think there’s quite a few of those out there from what I’ve heard. Doug Hoyes: Getting into trouble. Excellent. Well, on that depressing note, I think that’s a good place to end it. Scott Terrio: But there’s help available. Doug Hoyes: There is. There is and I think that’s really the point and I think, you know, as Scott had said, and thanks for being here today Scott. Here’s the summary; If you can’t keep up with your mortgage payments on your house, well consider selling it. It’s pretty much as simple as that. If you can sell it, pay the real estate commissions and other selling costs and get enough to pay to off the mortgage . . . boom. Scott Terrio: That’s often the best option. Doug Hoyes: If you can’t sell it for enough to cover the costs, you can talk to the lender to see if there’s some kind of deal that can be made. ‘Okay well, if I sell it and there’s going to be 10 or 20 000 owing can I convert that to a loan, pay it off over time. Scott Terrio: Probably, yeah. That’s . . . yeah. Scott Terrio: 50 or 100 or more. Scott Terrio: Yeah, a broader macro issues as Ben would say. Scott Terrio: But yeah, it’s going to be, you know, there’s going to be people that get hurt sooner by no real estate catastrophe other than just, you know, their stuff’s going wrong, right? Tenant didn’t pay them this month. Okay, now you’ve got to come up with that payment. Or just something as minor as that can often push people over their financial edge, right? Doug Hoyes: Yeah, and I think the people who bought a house recently, like in 2016, 2017, those are the ones who are more vulnerable than someone who bought it 10 years ago. Scott Terrio: Yeah 14, 15, 12, 13 they’re probably okay. Doug Hoyes: Unless of course they’ve been refinancing all the way along in which case we’ve got another thing to worry about. Scott Terrio: Why wouldn’t you? Doug Hoyes: Yeah, why wouldn’t you. Then head over to YouTube. We’ll see if the video actually recorded for this one. Scott Terrio: Don’t watch in the car, just listen. Doug Hoyes: That’s right, just listen. Scott Terrio: Just audio only in the car. 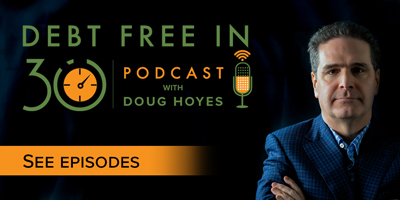 Doug Hoyes: You can subscribe to the Debt Free in 30 channel or just go to the show notes for a link to this video. And of course, you can subscribe to this podcast on iTunes, Apple Podcast, Google Play, Stitcher and most podcast apps. So, until next week, for Scott Terrio, thanks for listening. I’m Doug Hoyes. That was Debt Free in 30.